YouTube is filled with videos of drone pilots desperately trying to get their quadcopters back to dry land before the battery dies and it plummets into a lake. One solution is to just not fly your expensive toy over water; the other is to design and build a drone that works just as well when submerged. 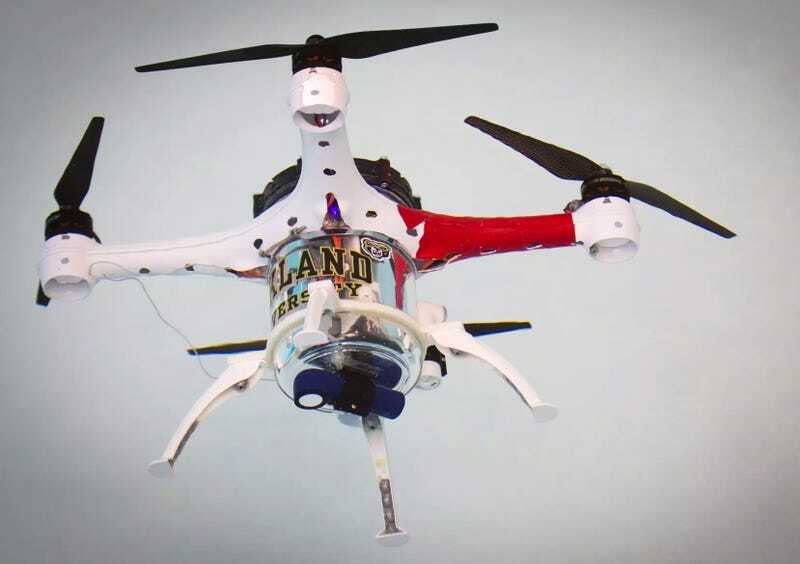 That’s what the engineers at Oakland University’s Embedded Systems Research Laboratory did with their Loon Copter. It looks like a conventional quadcopter with four rotors on top that let it soar through the air. But hanging below its air frame is a cylinder that can be used to change the drone’s buoyancy. When the cylinder is full of air, the Loon Copter can land and float on the surface of water and continue to use its spinning blades to propel it around. But the air can also be pumped out of that cylinder, filling it with water and causing the drone to sink, but on an angle. Once completely submerged, the Loon Copter looks more like an underwater plane as it propels itself through the water. Transitioning back to airborne flight is as easy as bringing the Loon Copter back to the surface, pumping out all that water ballast and taking to the skies again. The Loon Copter’s design could not only be copied to make consumer quadcopters safer to fly over water, it could also be adapted for search and rescue applications. The drone could quickly search a large body of water by flying hundreds of feet overhead and then automatically transition to an underwater rover when something of interest or concern needs further investigation.